Currently, I'm on a quest to improve things here and there, while waiting for Fred & Teddy to finish up the infamous cutscene. 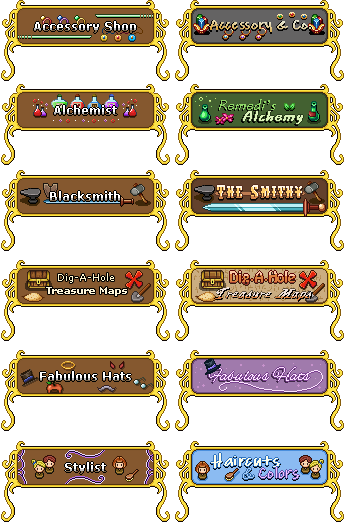 Aaand, one of the things I thought I'd fix is the old, boring, shop title-style! So, instead of them all being the same, with the same old boring brown BG, a few props here and there and the same style of font, I thought about how I could make them more unique and fit each of the stores better. I personally think this looks a lot more interesting to the eye! Plus, a bit more color can't be bad, right..? The interface is already brown enough as it is!